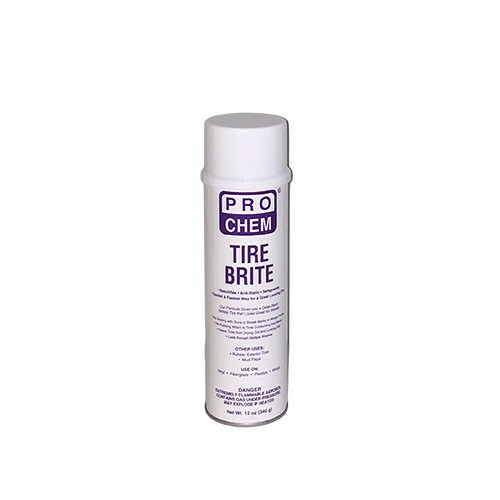 TIRE BRITE | Pro Chem, Inc.
TIRE BRITE is specially formulated to give that deep, glossy finish that will keep looking great for weeks, even through multiple washes. Keeps new tires looking their best and restores older tires to look like new with a deep luster. No wiping, no buffing, no mess. Just spray and drive away. TIRE BRITE keeps tires looking blacker longer while preventing browning, cracking and premature aging. Read label before using. Shake well before use. IMPORTANT – TIRE BRITE is slippery and should not be used on or near: gas, brake or clutch pedals; steering wheels; seats of motorcycles or bicycles or other surfaces which may be adversely affected by a slippery coating. Store can at 50°F to 80°F. Cold temperatures will lower propellant pressure, resulting in poor spray performance. Hold can 8 to 10 inches from tire or surface to be sprayed. Direct spray head away from face. Using a steady hand motion, apply a uniform coating to clean tires for best results. If desired, it may be sprayed on a rag and wiped on tires. Although TIRE BRITE will not harm or discolor most materials, always test first in a small, out-of-sight area before using on rubber surfaces.